The developers behind Oceanwide Plaza—a massive $1 billion project that has ground to a halt in Downtown LA—owe more than $52 million to some of its contractors, according to a Curbed review of publicly available real estate records. From June 29 until today, six subcontractors working on Oceanwide Plaza, including masonry, steel reinforcing, and concrete pouring companies, have recorded mechanic’s liens on the property totaling $62.5 million. It’s possible that some of the liens records over that seven-month period have been paid. But a lawsuit filed Thursday in Los Angeles County Superior Court shows that $52.8 million owed to Webcor Construction—which recorded the largest mechanic’s lien against Oceanwide—is still outstanding. A second Oceanwide subcontractor contacted by Curbed said it had been partially paid but was still owed about $550,000—more than half the amount of its $877,471 lien. Four of the six companies did not return messages seeking comment by the time of publication. The liens might be the latest sign that the tri-towered megadevelopment near the Staples Center in booming South Park has hit financial snags. If completed as planned, the three high-rises will hold 500 luxury condos, a large shopping mall, and a 104-room five-star Park Hyatt hotel with 160 condos of the same brand. Late last month, citing a potential “shortfall in financing from the project’s Chinese owner,” the Los Angeles Times reported that work has temporarily stopped on the project. In a statement to Curbed, developer Oceanwide Holdings confirmed it has suspended construction. Doing so would allow it to “restructure capital for the project,” the statement said. A spokesperson did not elaborate on how that would happen—or how much money was needed. Oceanwide was also named in an active FBI corruption probe into possible bribery and money laundering involving City Hall officials and real estate developers. Contractors and subcontractors record mechanic’s liens when they have not been paid on time for their work. They are not uncommon in the construction industry, but if left unpaid, these liens can have serious consequences. An unsettled lien can trigger a lawsuit or lead to court-ordered foreclosure on a property, said Ken Grossbart, a Los Angeles attorney who specializes in construction law. “It’s concerning because money is owed,” he said. Unpaid liens could also potentially “force the sale of the property,” said Eliopoulos. It is not exactly clear why Oceanwide is not paying its subcontractors. It’s possible, for example, that the developer could be in a dispute with those companies. But there are strong indications that financial troubles are to blame. 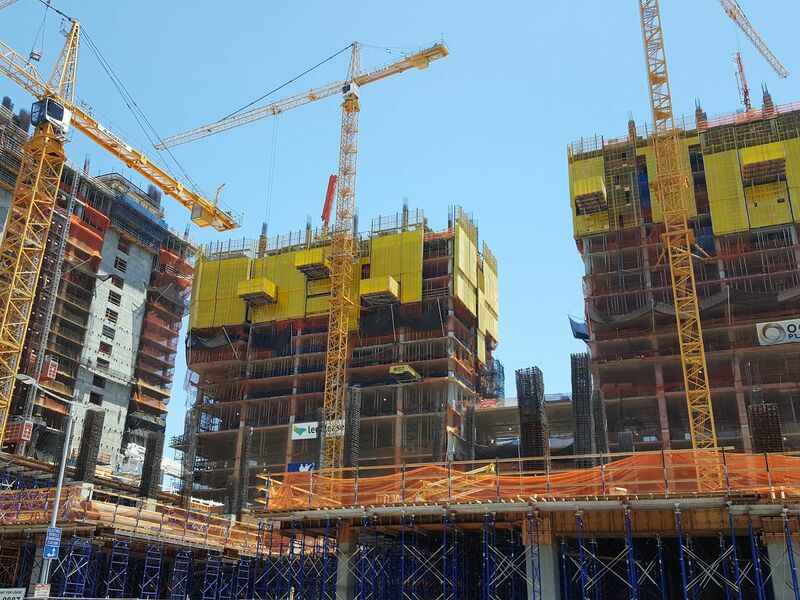 Lendlease added in the letter, which was shared with Curbed, that “among other failures,” Oceanwide “failed to maintain the minimum contractually required funds” in the project’s escrow account. It is not known how much Lendlease is owed, but it did sign a three-year contract for $814 million in 2016, according to a shareholder’s update posted on Oceanwide Holdings’s website. Lendlease has not filed a mechanic’s lien, and it did not return requests for comment.